"整個近紅外天空的全景影像揭露在銀河系之外的星系分佈。這張影像是由2微米全天巡天的擴散源目錄（XSC）超過150萬個的星系，和由點源目錄（PSC）得到接近5千萬個銀河系內的星點導出的。星系的顏色是依據UGC目錄、哈佛天文物理中心、Tully NBGC、LCRS、 2dFGRS、6dFGS和SDSS巡天等所得的紅移（各種不同的數值經由NASA/IPAC的NASA銀河系外數據庫整合），或從K頻帶（2.2微米）光電測光推導後給予的。藍色是最接近的（z < 0.01），綠色在普通的距離上（0.01 < z < 0.04），紅色是2MASS所能分辨距離最遠的（0.04 < z < 0.1）。這張圖是以以銀河為中心採用等面積的埃托夫（ Aitoff）投影法繪製的銀河座標系圖。"  由湯馬斯傑瑞繪圖（" IPAC）"
^ Biggest void in space is 1 billion light years across - space - 24 August 2007 - New Scientist Space. [2008-04-01]. （原始内容存档于2008-05-15）. Vicent J. Martínez, Jean-Luc Starck, Enn Saar, David L. Donoho, Simon Reynolds, Pablo de la Cruz, and Silvestre Paredes. MORPHOLOGY OF THE GALAXY DISTRIBUTION FROM WAVELET DENOISING. APJ. 2005-08-15. arXiv:astro-ph/0508326. J. R. Mureika and C. C. Dyer. Multifractal Analysis of Packed Swiss Cheese Cosmologies. Classical and Quantum Gravity. v1. 2005-05-17. arXiv:gr-qc/0505083. （原始内容 (PDF)存档于2007-09-28）. J. R. Mureika. 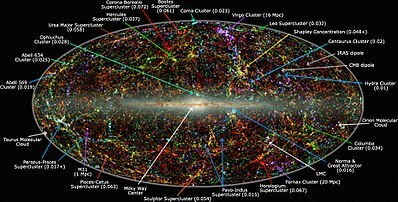 The Packed Swiss Cheese Cosmology and Multifractal Large-Scale Structure in the Universe (PDF). 2003-09-06. Hubble, VLT and Spitzer Capture Galaxy Formation in the Early Universe.